Otto Black of Pinckney leads the 2015 Michigan Amateur after opening with a 3-under 67 at Plum Hollow Country Club. “I hit a lot of fairways, kept it out of the rough, gave myself a lot of birdie chances, made a few, it was solid, stress free,” Black said. 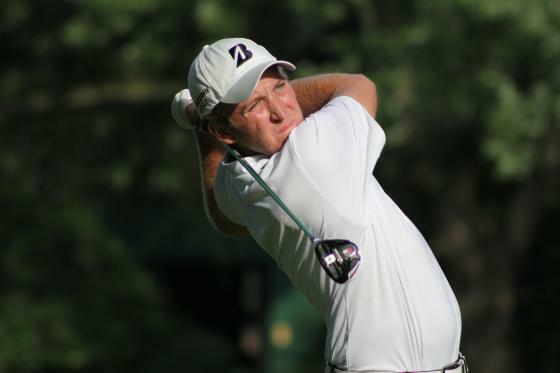 Black, a 21-year-old senior at the University of Toledo, was one stroke ahead of Michigan State golfer Sam Weatherhead of Grand Rapids. A group of four shot 69 and are two off the pace: University of Michigan golfer Reed Hrynewich of Muskegon, former MSU golfer Carson Castellani of East Lansing, University of Detroit Mercy golfer Kyles Gaines of Oxford and Hope College golfer Winton Munch of Traverse City. Henry Do of Canton, the defending champion and a University of North Carolina golfer, was among six golfers who shot even-par 70. The field of 156 golfers play another round of stroke play Tuesday to determine the low 64 scorers through 36 holes. Those golfers will go into single elimination match play through Friday to determine a champion. Black, who won the Horton Smith Invitational at Detroit Golf Club earlier this summer, was a semifinalist in the Michigan Amateur a year ago. He lost to eventual runner-up Steve Anderson of Troy in 19 holes. Weatherhead, like Black, wants to keep his golf game steady for the first two rounds, and he also said he can’t wait for match play to get started. Tee times will start at 7:30 a.m. Tuesday. As with all GAM tournaments, spectators are welcome and admission is free. Live scoring is available at www.gam.org where you can find daily tournament coverage and photo galleries. The 104th Michigan Amateur Championship presented by Miles of Golf/Kendall Academy/Titleist. It is organized by the Golf Association of Michigan, which was founded in 1919 and serves as the governing body for amateur golf in the state. The association provides membership to more than 60,000 golfers and more than 400 golf courses, conducts 29 amateur championships with more than 70 days of qualifying and competition for golfers of all abilities, and oversees 18 USGA qualifying events each year. The GAM also hosts several one-day golf events called GAM Golf Days that allow GAM members to play in a less-competitive setting than a traditional tournament, and also conducts a popular state championship scramble event and sends teams to state and international match play events. In addition, the GAM is licensed by the United States Golf Association to measure and rate golf courses in the state of Michigan in accordance with the USGA Course Rating System. The GAM enables its members to post scores and establish an official GAM/USGA handicap index. Visit www.gam.org for more information. TALMER BANK & TRUST: A special thanks to sponsor Talmer Bank & Trust, which will be hosting the Player Lunch for the Michigan Amateur Tuesday.